American made with quality construction and great value, Shadow Horse trailers are the perfect choice for serious horse enthusiasts, whether it be a luxury living quarters or a simpler bumper tow model. 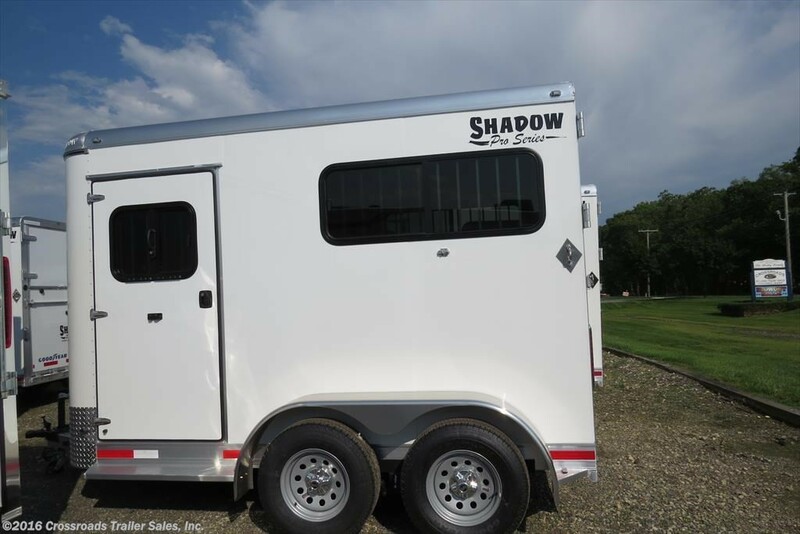 Shadow is the leading manufacturer of aluminum horse trailers in the U.S., keeping the winning edge by incorporating exciting new features such as extra large rear tacks, sliding mid tacks, and large bus windows for extra ventilation and comfort in larger trailers. 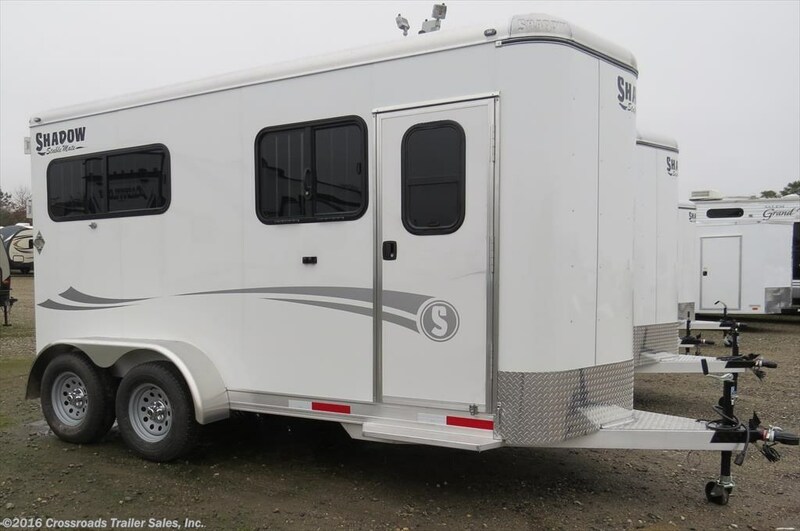 Shadow Stablemate horse trailers feature lightweight and durable all-aluminum frames, interlocking aluminum floors, one piece aluminum roof and all aluminum exterior walls – all for the same price as comparable steel body trailers. Be it living quarter models, goosenecks, bumper pulls, slant or straight loads, you can count on Shadow quality and innovation. Built and designed “for horse people, by horse people,” Shadow Trailers look for design innovation that focuses on quality, safety and affordability. Introduced in 2006, larger living quarter Shadow Horse Trailers feature Easy Glide Slide Out Living Quarters, which add more living space while keeping the trailers affordable. The Sliding Mid Tack features added storage space without the cost of a traditional Mid-Tack trailer. 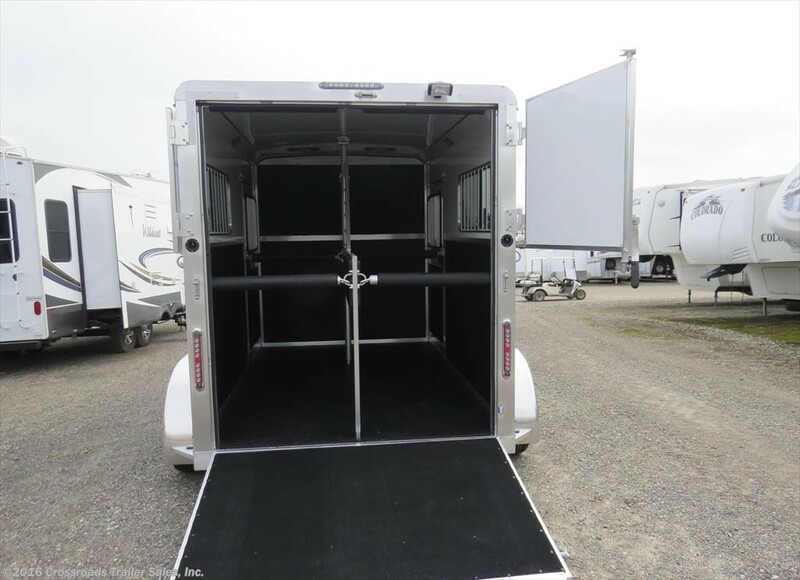 The 24-inch Sliding Mid Tack, which pulls out from the trailer, allows horsemen to comfortably reach over 900 lbs of gear without entering the trailer. The extra large rear tack options give you unprecedented storage choices. Available in 7ft and 8ft trailers, you can open a collapsible tack wall to work out of your trailer or relocate the saddle racks into the tack stall poles. Standard on 7ft and 8ft wide trailers are curb-side extra-large drop down bus windows and large street-side slider windows. These large windows ensure healthy, comfortable ventilation for your horses. Also available are tail-side drop windows, if more ventilation is needed. The same high-quality construction and features including, rear door and escape door locks, white lined ceiling and horse vents, LED lights and stainless steel hinges, drop-down feed windows, folding rear tack area, and spring return and gate adjustment on gates, are available across the Shadow horse trailer line. Shadow manufactures a complete line of living quarter trailers, with components manufactured in the U.S., as well as storage-rich goosenecks for transporting up to six horses. But, perhaps nowhere is the quality and value of the Shadow horse trailer more evident than in the bumper tow straight load models in Stablemate and Pro Series models. Stablemates offer the durability, safety and construction of steel trailers, but are much lighter and easier to tow. The practical Stablemates are loaded with quality features at an affordable price. Like the stablemate models, Shadow’s Pro Series models are the trailers of choice for thousands of equine enthusiasts and sportsmen, including Hall of Famers like Austin Shepard, Jody Galyean, Randy Wilson, Tom Lyons, Kobie Wood and clinician Pat Parelli. Shadow Pro Series trailers are constructed with all aluminum tube framing and aluminum skin. Spring Leak axles, electric brakes, and Goodyear tires make for a safe, smooth ride. The rear gate and front escape doors feature a one key-one lock system. 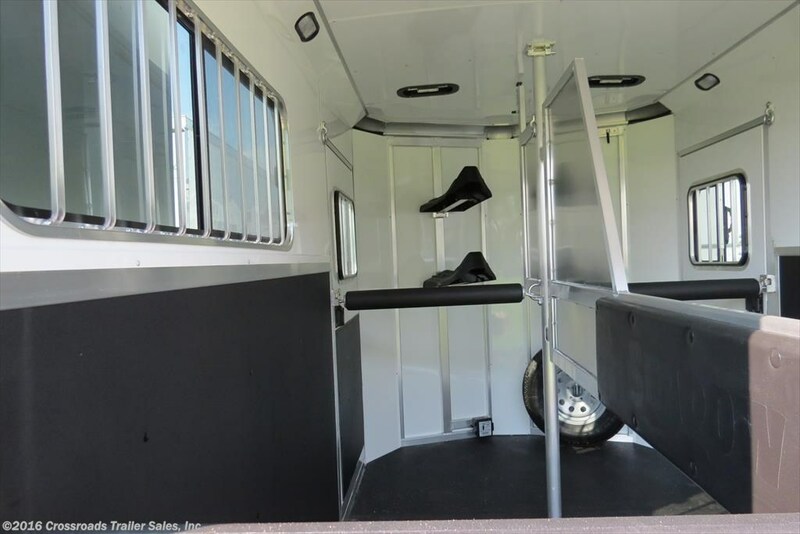 The horse area is fully lined and insulated with 42-inch wide stalls and easily removable padded dividers. Each stall includes two tie rings, large drop feed windows and floor mats. Dress rooms include a fixed slant wall, saddle racks provisions, bridle hooks, floor mats and dome and porch lights. Crossroads Trailer Sales in Newfield is NJ’s #1 RV and Trailer Dealer. Have a trailer that needs repairing? Call (856) 697-4497 or visit our service department to make sure your horse trailer is in top-condition. Happy Camping!